Wells Middle School’s PFC update for the week of 5-10-2011. Prior Wells Middle School PFC updates available here. Relay for Life will be held at Wells this year on May 14th and 15th. There will be a special Fireworks show on Saturday May 14th. Please see the attached flyer for more information. Dublin Farmers’ Market: This Thursday, May 12, the City of Dublin launches its new Farmers’ Market! 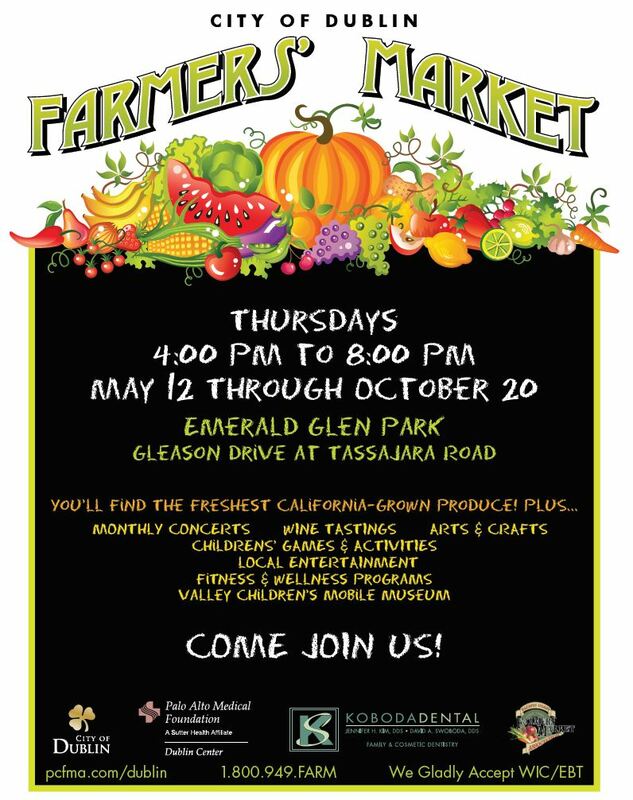 The Market will be held every Thursday, from 4:00 p.m. to 8:00 p.m. at Emerald Glen Park (on the Gleason Dr. side) until October 20. While you can expect to find the freshest California produce available, you’ll also discover that the Dublin Farmers’ Market promises fun for the whole family. There will be “theme weeks” each month to entertain and educate. Please visit the website at http://www.ci.dublin.ca.us/index.aspx?NID=928. Ready, Set, Recycle! From now until June, Alameda County residents will have the chance to win cash and prizes by keeping recyclable and compostable materials out of their trash, and in the correct bins. The contest works like this: on regular garbage collection days, the Ready Set Recycle Contest Prize Crew will travel ahead of garbage collection trucks, randomly select trash bins and sort their contents into three categories; recyclables, compostables and garbage. The household that has the least amount of recyclables and compostables in the garbage bin wins! Multiple winners will be announced each week and will receive cash or prizes. Further information can be found at ReadySetRecycleContest.org. Tommy T’s Fundraiser: Wells is having a fundraiser at Tommy T’s on Thursday, June 3rd at 7:30 pm. Each ticket is only $15 and $10 of it goes straight to Wells! This fundraiser, which is being put on by the Leadership Students, will help raise money for campus improvements. Macy’s Coupons to Benefit Barton Reading: Barton Reading Tutors are selling Macy’s Community Shopping Day tickets that are good for $10 off a purchase of $25 or more this Saturday, plus exclusive 10 and 20% savings. This is how the fundraiser works: You purchase a coupon from a Wells Tutor for $10, and the Barton team keeps the whole $10. You then go to Macys this Saturday and shop with your coupon and you get $10 off your first purchase (getting your initial donation returned!). This is a great way to support a worthwhile program and to spend some time for you at the mall! If you want to show your support for this program, please call Catherine Groenenwald at 828-5148 to buy a coupon or just make a donation!